Kotopita, which means chicken pie, is one of many types of Greek meat pites. This particular meat pie is made with chicken and shaped into a galette. This particular pie is made with a horiatiko (village) phyllo pastry crust, which is very easy to handle and roll. I make kotopita from scratch or with either leftover chicken or turkey, with different kinds of fillings. Two similar recipes are included in Volume 2 of my e-cookbook. In French, “galette” is a term used to describe various types of flat, round or free-form crusty sweet or savoury pastries. You can serve this Kotopita (chicken galette) as a main dish with a salad or make smaller ones as starters. If you like you can make them free-form or use your muffin tins. For the starters, grease your muffin tins with olive oil, cut the phyllo with a cookie cutter and line them with phyllo. 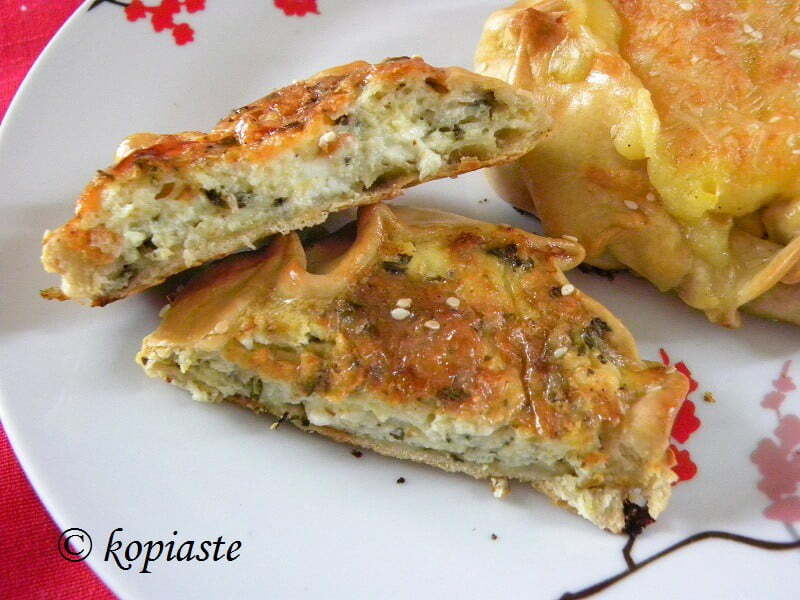 Add the filling and cheese on top and bake to make mini “kotopitakia”. You can serve this Kotopita as a main dish with a salad or during the holidays you can make smaller ones as a starter. If you like you can make them free-form or use your muffin tins. Grease your muffin tins with olive oil, line it with phyllo, add the filling and cheese on top and bake to make mini “kotopitakia”. You do not necessarily have to make them round but you can also make them rectangular or square. This is optional. I had some leftover Potato and pumpkin puree but you can add more filling and only some grated cheese one top. Beat the egg with a fork and mix in the milk. Brush with the egg wash and sprinkle some sesame seeds on top. (Instead of egg-wash you can brush the phyllo with olive oil). Bake in a preheated oven to 180o C / 350o F until golden, for about 45 minutes. Turkey Galette with Christmas leftovers. Kotopita (chicken galette) is an all times favourite with our family. This year I made it with leftover turkey. The phyllo was different as I used village type bread flour in which apart from the other ingredients, I added Greek yoghurt and mustard when making the dough. For 800 grams of flour I added 100 grams Greek yoghurt, 1 tsp mild mustard, 1/4 cup olive oil, 1 tsp salt and enough water (not tepid) to make the dough. In the filling I did not add bell peppers nor parsley but added corn and peas, which I cooked for five minutes The spices I used were: carino (chicken seasoning) thyme, oregano and sweet paprika and of course salt. The filling was topped with grated graviera and halloumi. I also did not add an egg wash on top but brushed the phyllo with olive oil. If you have leftovers during New Year, try them as the taste was amazing! The original recipe above was updated in red and new photos were added. To make the Béchamel sauce, heat the milk and set aside. Knead the dough for a few minutes and divide it into 6 - 8 pieces. Form them into a ball, dusting each piece with flour. The time mentioned above is for a precooked chicken. Lovely pies and great video! Those mini chicken galette with piled cheese look so irresistible. Thanks for the video too. Yumm, super delicious pies,wonderful video,thanks for sharing Ivy. These videos are so precious (both of them) and once I get decent internet service (in Lebanon it is a challenge!) I will be dowloading them frequently! I wish you and your family wonderful holidays! Yummy pies, they look fab! Wow!These pies look fantastic,Ivy!I am loving your videos! This looks amazing, especially the potato pumpkin filling! Cela fait un moment que je ne suis pas venue chez toi et je constate que j’ai raté beaucoup de gourmandises. These look absolutely delicious Ivy! And I love your video! Thanks for making it! Beautiful Galattes with such a tasty filling! Good job on the video!